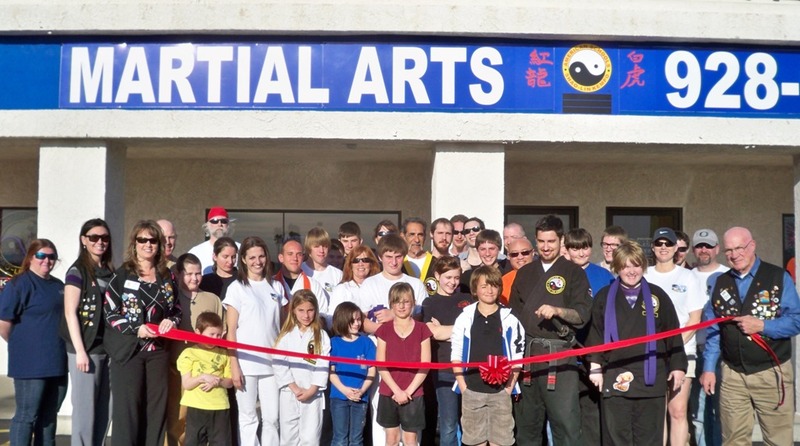 American Schools of Shao-Lin Kempo recently joined the Chamber of Commerce. The school teaches the children to follow directions, cooperate with others and to enjoy exercise. The adult students gain the tools of strength, flexibility and increased balance, while learning practical self defense. The Chamber of Commerce Ambassadors held a ribbon cutting ceremony for the grand opening of the school. On hand for the ceremony from left to right are: Amy Sugamele, Cherie Pearlswig, Headmaster Robert Pearlswig, Zach Pearlswig and Bob Keller. American Schools of Shao-Lin Kemp is located in the Safeway Plaza at 1690 McCulloch Blvd., #104 and can be reached at 680-4121.